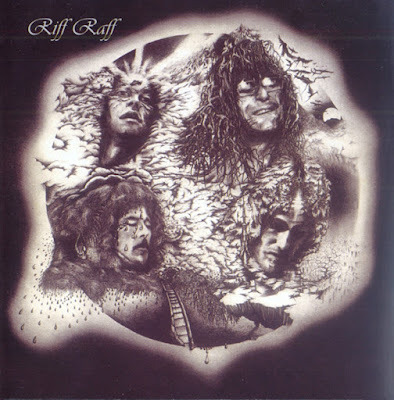 Riff Raff's self-titled effort from 1973 was the band's first album proper. Alan Marshall was not replaced when he left, with Tommy Eyre, Roger Sutton, and Pete Kirtley all taking turns on the vocal chores. The jazz -rock sound that Eyre and Sutton had explored with Mark-Almond was the springboard for the exploratory rock music made by Riff Raff. Here deep groove -- à la Brian Auger's Oblivion Express -- and tough rock choruses and dynamics were married to the jazz sense of structure and composition. Far more "progressive" sounding than their early demos, this music nonetheless has little to do with the excesses of the Canterbury Scene. From the opener, with the glorious Fender Rhodes and electric guitar interplay in which the blues and jazz commingle in a rock picture frame, through the improvisational melodic and modal work on "Dreaming" to the glorious theatricality and drama of "La Même Chose" that closes the album, Riff Raff comes off as one of the most original, innovative, and brilliant bands of the early '70s. It's too bad they never got to America; they would have been as huge as their former bosses in Mark-Almond.